Mammillaria napina Photo by: Andrea B. Origin and Habitat: Puebla, Southern-western Mexico. Type locality: Mountains west of Tehuacan, Mexico. Altitude: 1700 - 2350 metres above sea level. 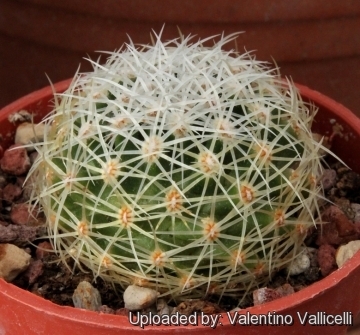 Description: Habit: It is a small perennial geophyte cactus usually solitary, rarely clustering and barely rising above ground level. 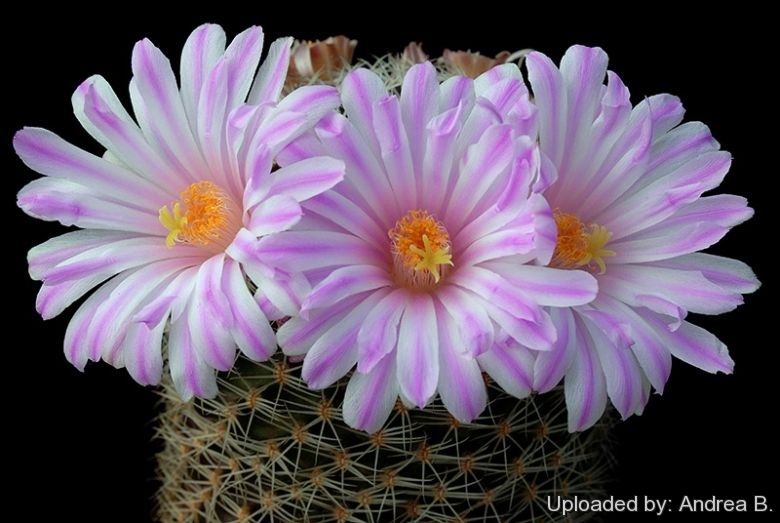 Flowers are quite large for a Mammillaria, pale carmine to pink with near white throats. Roots: Tap root, thick, but when in a cluster of 3 or 4 somewhat spindle-shaped. Stems: Semiglobose to globose, 4-6 high and in diameter. Tubercle: Conical low, terete in section, not at all milky. Parastichy number 8 - 13. Axil: Somewhat woolly or naked. Radial spine: 10-12, pectinate, slightly curved, glassy white with yellow bases, 8-10 mm long, spreading and interlacing. Central spine: Usually absent, rarely one. Flower: Bell shaped, up to 40 mm long and in diameter pale carmine or pink, with distinctive whitish throats,. Petals pale pink with deeper mid-stripe. Fruit: Ripening almost embedded in the plant body, colourless. 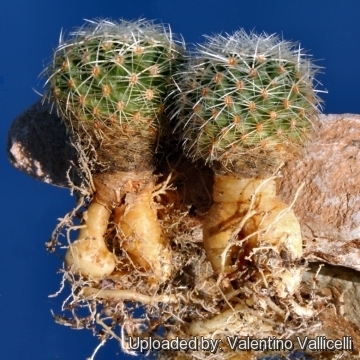 Cultivation and Propagation: Is one of the dwarf tuberose Mammillaria with large flowers, somewhat difficult to cultivate. During the summer it is best to keep the plants outside where the temperature can rise to over 30° C with no harm to the plant, recommended for any collection that needs lots of light with ample airflow. Repotting: Repotting every 2-3 years. A pot a little larger than average for the size of the plant should be used, filled with very porous compost. Use a deep pot with good drainage. Propagation: Direct sow after last frost. (seldom produces offsets). Seeds germinate in 7-14 days at 21-27° C in spring, remove the glass cover gradually as the plants develops and keep ventilated, no full sun for young plants! The seedlings should not be disturbed until they are well rooted, after which they can be planted separately in small pots.